Gulf of Naples at Naples, with Mount Vesuvius on the horizon. 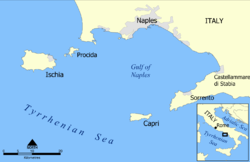 Regional map of the Gulf of Naples. The Gulf of Naples (Italian: Golfo di Napoli) is on the south-western coast of Italy. Also called the Bay of Naples, it is a c.15-kilometre-wide (9.3 mi) gulf in the province of Naples, Campania region. The bay opens to the west into the Mediterranean Sea. It is bordered on the north by Naples and Pozzuoli, on the east by Mount Vesuvius, and on the south by Sorrento and the Sorrentine Peninsula. The Peninsula separates the Gulf of Naples from the Gulf of Salerno, which includes the Amalfi coast. The islands of Capri, Ischia and Procida are in the Gulf of Naples. The area is a tourist destination, with the seaside Roman ruins of Pompeii and Herculaneum at the foot of Mount Vesuvius. 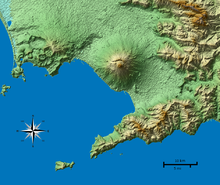 These towns were covered with volcanic ash in the AD 79 eruption of Vesuvius. Fin whales can sometimes be seen in Gulf of Pozzuoli. ↑ Gulf of Naples islands (PDF). ↑ gentedipiazza (24 October 2007). "balena nel golfo di pozzuoli" – via YouTube.